As far as these articulated hitches go it is good value for money. Took the camper up the Fortesque river bed , deep v crossings, twisting ravines etc. with no probs. As far as the plastic levers go time will tell. Will put a bag over them when not using the trailer to help preserve them. 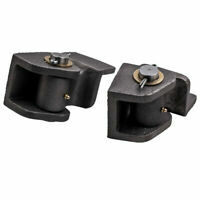 If you need an off-road hitch on a conventional 50mm ball then these work a treat. Highly recommended. As described and perfect for a trailer using rugged 4WD tracks.